Why is Vitamin B1 (Thiamine) important for my horse’s health? An adequate amount of Vitamin B1 (otherwise known as Thiamine) is essential for the health of a horse, as it assists with carbohydrate metabolism (maintenance) (energy), nerve transmission and muscular function. It is necessary for the proper function of the heart and nervous system. Increasing the thiamine supply above the basic minimum nutritional requirement can have an apparent calming effect on an excitable horse. Note: Nervousness, stress, and poor performance can be a result of a deficiency in essential vitamins, poor quality feed, transporting, after sickness, and during periods of high-performance work. 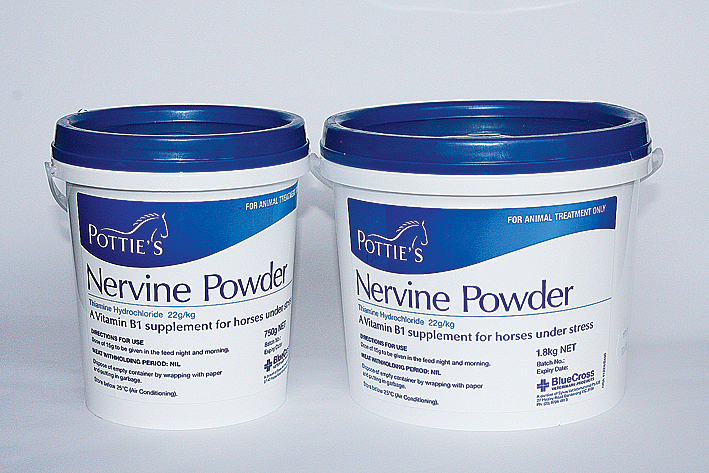 Potties Nervine Powder should be fed 30g daily (15g scoop provided). Either 30g fed once daily or 15g fed twice daily mixed into the feed.